The Organized Retail Crime effort at Kroger -- Great Job Kroger! 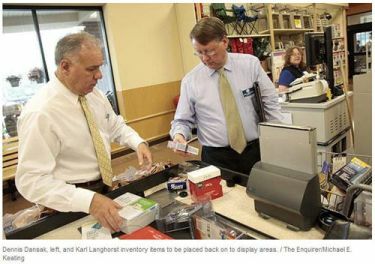 Yesterday, the Cincinnati Enquirer and the USA Today ran an article about Kroger's fight against Organized Retail Crime and the efforts of Dennis Dansak and the entire Kroger LP team. Entitled "Retailers Reining in Sophisticated Theft Rings," it details one recent case in Seattle where 32 suspects were apprehended for stealing $4.87 million worth of merchandise from six retailers over 16 months and shipped vehicles full of stolen goods overseas to be sold in Cambodia. The article is a great story about and testament to how Kroger, Dennis Dansak, and his team have developed the ORC efforts and the success they've had since beginning their fight in 2007. Under Karl Langhorst's, Director of Loss Prevention for Kroger, vision the ORC team has evolved as one of the industry's strongest teams. They've established a "best in class" model that has added value to the industry, and to this ever-increasing national effort. The article also recognizes eBay and and their efforts with the PROACT program that has grown from 44 retailers to more than 285 as of January 2011. With the ongoing national press coverage this issue is now getting, the new legislation currently in Congress that provides for a new federal organized retail crime unit will hopefully become reality. Every Loss Prevention executive in the industry and every retailer should write their respective US Congressperson and US Senator and urge the government to take action and support this new bill. ORC -- The "Gateway Crime"